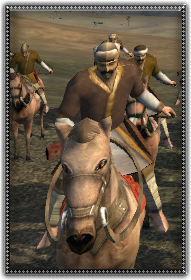 The biggest bulk of a Kypchak raiding company is comprised of these men. They are Turkic nomads who do not possess anything besides their horse and their bow, bolstering Kypchak armies with the slight hope of getting a little bit of the loot that the nobles will leave for them. Their decent archery skills are useful, but their lack of armour and close combat experience makes them vulnerable.